MainScapes, Inc is a landscape maintenance and construction company providing services to commercial, institutional, and government properties within the Washington, DC and Baltimore, Maryland metropolitan areas. MainScapes has been in business for almost 20 years and has plenty of experience to deliver the best quality landscaping to your business. Its expertise and professional management provides a solid foundation for its continuous success. Ground Maintenance. These services include mulching, mowing, leaf removal, and pruning. Get your lawn into shape with MainScapes! Turf. MainScapes can provide your business with fertilization and pest control, as well as aeration and over-seeding services. Tree and Shrub. Services in this category include dormant oil, pest control, and fertilization. Let the experts prepare your property landscape for the busy season! 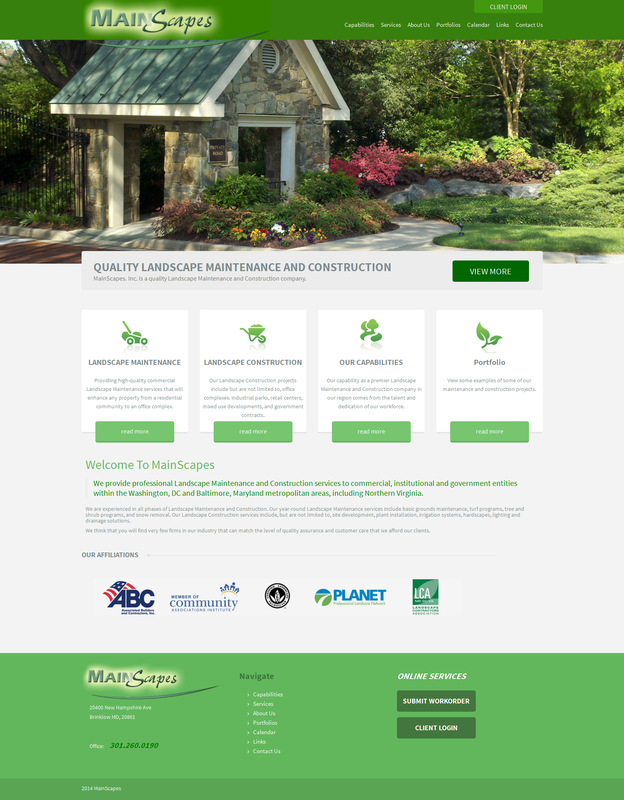 Check out the new MainScapes website designed by Adventure Web Productions at http://www.mainscapes.com. Adventure Web Productions is one of the few full service internet development and web marketing companies in the Baltimore Metropolitan area. We specialize in affordable custom web design and development, software development, content management systems (CMS), database integration, e-marketing solutions, social media strategy and implementation, organic search engine optimization, pay per click campaigning. For professional full-service Internet development, hosting, and web marketing needs, contact Adventure Web Productions by calling (410)-788-7007 or by clicking here today! For more information about web development, contact Adventure Web Productions now!